Mr. Henratty is a Florida native born on January 16, 1972 and raised in Fort Lauderdale. He graduated from the University of Florida in 1994, and received his juris doctor from Mississippi College School of Law in 1996. Mr. Henratty is recognized as one of Florida’s pre-eminent trial lawyers concentrating in matters involving medical malpractice, product/vehicle injury and wrongful death. His successful career of jury trials is exemplified by two closing arguments in different Florida jurisdictions resulting in verdicts of $10.3 million and $31.4 million dollars. The latter verdict earned Mr. Henratty the accolade of the Most Effective Personal Injury Lawyer in 2011 by the Daily Business Review. Board-certified as a Civil Trial Lawyer by the Florida Bar, Mr. Henratty has tried over 50 jury cases to verdict. Mr. Henratty is licensed to practice in all Florida State Courts, the U.S. District Courts for the Northern, Middle, and Southern Districts of Florida, as well as the 11th Circuit Court of Appeal. 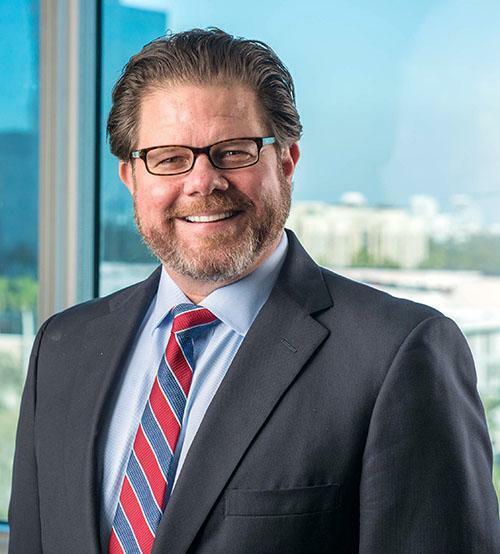 As an experienced litigation attorney, Mr. Henratty has attended prestigious trial advocacy programs at Stetson University School of Law and the University of Florida Levin College of Law. Mr. Henratty has also conducted appellate argument before the 4th District Court of Appeal in West Palm Beach. In the past, Mr. Henratty defended Fortune 500 companies against asbestos- mesothelioma claims for the Atlanta office of Hawkins Parnell Thackston & Young, LLP. He also defended numerous insurance companies while working at statewide insurance defense firms. This experience gave him insight into how insurance companies handle, defend and evaluate injury and wrongful death claims. In 2007, Mr. Henratty joined attorney Stephen Malove, formerly of the prestigious Law Firm Spence, Payne, Massington which originated from the Miami linage of the storied Perry Nichols Law Firm. The boutique MaloveHenratty Law Firm continued for over a decade fighting for the catastrophically injured against giant insurance companies. In 2017, Mr. Henratty was inducted and proudly served as the President of the Broward County Trial Lawyers Association and continues to serve on its board of directors. Mr. Henratty was inducted in 2011 to the American Board of Trial Advocates and is an Eagle member of the Florida Justice Association. In 2019, Mr. Henratty brought his extensive knowledge, skill, passion and expertise to the legendary and distinguished Ft. Lauderdale based firm of Krupnick, Campbell where he fights every day for individuals and their families who have been wronged by the negligence of others. Mr. Henratty is a founder and President of the Frankie Foundation, a 501(c)(3) charitable organization. This organization provides Automated External Defibrillators (AED’S) to other charities and churches in need.